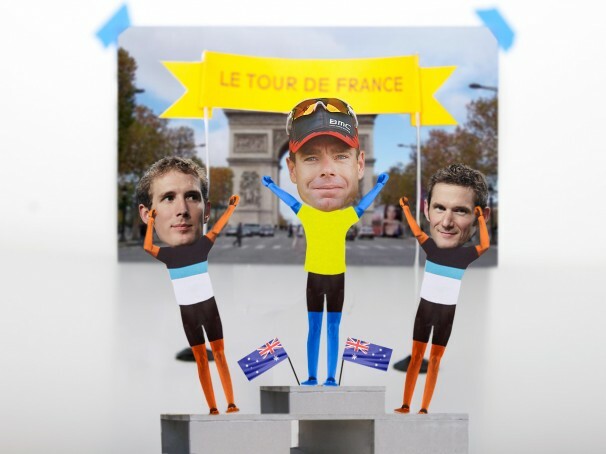 What the Heroes have learned covering our first Tour de France: No. 1. When three L’Equipe reporters walk out of a Carrefour grocery store bathroom in Gap do not walk in. Just get back in your car and drive 30 kilometers (that should be just right) and find another bathroom. No. 2. If you see an Australian family on some mountain pass waiting for the tour, introduce yourself to them immediately. They are awesome and really want to meet you. But be prepared to be invited to party at the Schleck Fan Club on the top of Alpe d’Huez and please don’t forget: you love Cadel. No. 3. If a sheepherder asks for help, stop, get out of your car and help. Sheepherders do not ask for help much so it probably is important. No.4. Never doubt the men that can climb and time trial. The Maillot Jaune is his. Every ten to fifteen years they give it to a pure climber but not this year. This tour was defined by many a Hero: Mr. T. Voeckler, Cadel Evans, Philippe Gilbert, Thor Hushovd, Honey Badger Cav, Johnny Hoogerland, Andy Schleck, Alberto Contador, Jelle V. and Edvald to name just a few. In France it was all about, of course, the French, Mr. T. Voeckler to be exact. On the teenage girl front it was….guess…guess…? Yes, you are correct! Andy “skinny is cool” Schleck. The heroes noticed that what we call “Schleckmania” was an international phenomenon this year. Teens from around the world were letting loose high-pitched screams that obliterated the sound of helicopters and motos when the brother’s road by. Who are we trying to kid? Some of those were our high-pitched screams. On a final note, this Sunday we Heroes walked into a ten-building village where there are more cows, sheep and barn cats than humans. At once, an old woman named Flor approached us and asked how the Tour was going. In our best “I studied in college twenty years ago” French, we kneeled on the side of the road for an hour and recounted Le Tour. In translated English, it went something like this, “Gilbert the Belgian…, Thor the Nordmann…, Voeckler the Gentile Warrior…, many crashes, many hills, many cyclist cried, The brother’s Schleck, with Andy on the Col du Galibier, Contador is sad and ran out of energy, the soft voiced Australian received the yellow jersey after race in Grenoble. He will win this day, today.” To anyone that walked by it must have sounded like French actors pretending to be Hollywood Indians in an old western. One Hero who wisely did not try to speak a bit of French pushed a few pebbles around in the dirt as the Tour was recounted. While listening Flor, holding a hand carved cane, pushed along a few rocks of her own. Bye Bye France. Tags: 2011 Tour de France.